Add a Dash of Cultural Imperialism: Japanese Food and Cooking (1956), Part 2 – I'll Make It Myself! From the Foreword. The American professional, his housewife, and the hunched over Japanese farmer…? Let’s talk learning foodways as part of your culture. If you are told that a certain food is gross by media, peers, family, or society at large, you will probably internalize that message on some level. Case in point: Brussels sprouts and liver and onions for Americans of a certain generation. * Brussels sprouts are divine when they are cooked with care: sauteed or roasted or shaved into salads. They are not very delicious when over-boiled and under-seasoned. Some flavors that taste bad to children are delicious when one has developed an adult palate as well as a personal palate. The child who once rejected bitter foods like coffee; cut their tea with half milk and lots of sugar; turned their nose up at pungent foods like natto or cabbage rolls or fish; found umeboshi or grapefruit too tart; disliked the earthiness of beets or mushrooms may grow into an adult who loves those foods if given the chance to try them again and have them prepared well. Likewise, an adult who has never experienced certain foods that are outside of their regional or cultural culinary repertoire, may be intimidated by them or assume incorrectly that those ingredients or meals are “gross.” I was nervous the first time I ate sushi because I didn’t grow up eating a lot of fish other than fried white fish. I didn’t like eating sweet potatoes because I’d never had them outside of sweet potato casserole at Thanksgiving. My parents didn’t like beets or Brussels sprouts, so I didn’t eat them until I was in my mid-20s. In Japan, I was intimidated by the smell of natto and the sour umeboshi, however, because I was told that “foreigners” don’t like them (more on this in a moment), I tended to stay away. 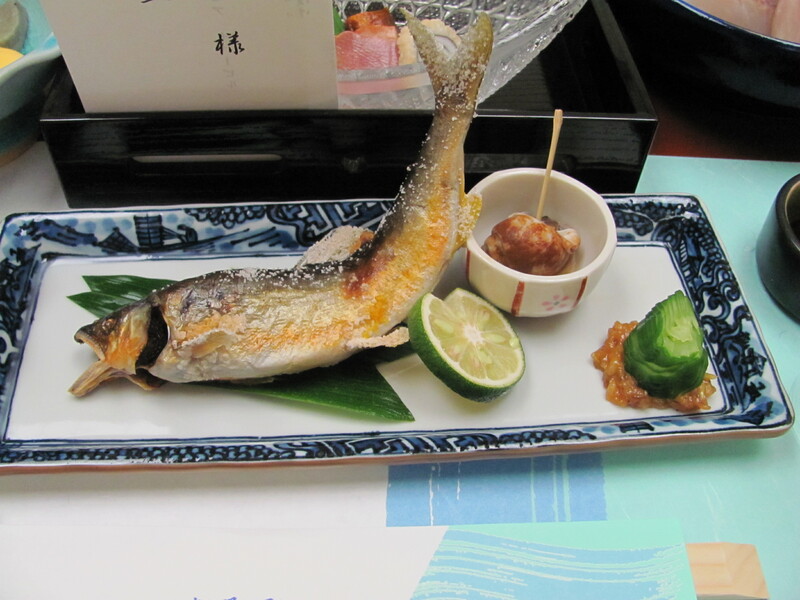 I had trouble eating fish served whole because I didn’t have any experience eating them while they “stared” at me and I didn’t know how to eat them–how to pick the meat off the bones, if you were meant to eat the head or the tail (I know, I know), etc. Living in Japan as an exchange student and later as a worker made me realize I had been missing out on a lot of foods I had been told weren’t good. Not all natto and umeboshi are created equal, just like not all beets or mushrooms are cooked well or mixed with other foods that complement their flavors. And in order to be able to be respectful and learn to eat the sorts of cuisine that are served at enkai and ryokan, I had to take a deep look at why I was nervous about them: a combination of inexperience and fear. I still am not a huge fan of eating organ meat (though I don’t eat a lot of meat in general anymore), but I appreciate using as much of the animal as possible even if I dislike the taste. This, I think, is an approach that respects the cuisine of other cultures: willingness to try new things without judgment and not thinking that consuming something “exotic” (ew) make you better than others. In short: My cuisine is not better than yours; it is simply different. All cuisines have the potential to be healthy or unhealthy. Finally, if we introduce foods with the caveat that “foreigners don’t like it” or “it’s gross,” those messages will be internalized and prevent people from reserving judgment about the taste of a food until they have tried it. Whole fish at a hotel dinner in Nagoya. I miss you, Japan. Foreigners make wince at the first reading of the following paragraphs, but this a mistake correctable in the eating (1). While he’s right that trying new foods prepared well is often the way to throw off squeamish assumptions about their perceived foreignness and potential unpleasantness, presenting these types of fish as “this is kinda gross but try it, you’ll like it!” a rather ineffectual way to go about it. *These cultural relics of older generations that make it into children’s media are truly bizarre. I grew up in the ‘90s, and I distinctly remember “liver and onions” and borscht being described as gross in cartoons (I want to say Doug for the first one and Rugrats for the second, but I am positive these impressions were not made solely from these shows alone.) I also remember being incredibly confused by someone making an excuse of not being able to go on a date because she was “washing her hair.” Having grown up in a time when daily showers that included hair washing were the normal and hairstyles did not have to be set in rollers, this concept was alien to me. none yet, but it’s coming. Pingback: Add a Dash of Cultural Imperialism: Japanese Food and Cooking (1956), Part 1 | I'll Make It Myself! Pingback: Add a Dash of Cultural Imperialism: Japanese Food and Cooking (1956), Part 3 | I'll Make It Myself! Pingback: Add a Dash of Cultural Imperialism: Japanese Food and Cooking (1956), Part 4 | I'll Make It Myself! Pingback: Add a Dash of Cultural Imperialism: Japanese Food and Cooking (1956), Part 5 | I'll Make It Myself!